Meanwhile Disney's Parks and Resorts are posting strong growth while shoring up its stalling Media Networks segment with a confluence of growth catalysts via streaming with Hulu (30% stake and will likely be expanded to a majority 60% stake after the Fox acquisition), BAMTech, Sling, ESPN streaming service and a Disney branded service coming in 2019 to directly compete with Netflix (NFLX). Disney is closing the gap in streaming as Hulu grows much more rapidly than Netflix and in the backdrop, ESPN and direct to consumer Disney branded streaming service comes to fruition. Disney recently reported Q2 FY2018 revenue growth across every business segment with an overall revenue growth of 9%. Disney offers a compelling long-term investment opportunity considering the growth, Fox acquisition, pipeline, Media Networks remediation plan, diversity of its portfolio, tax reform, share repurchase program and dividend growth. Disney via its distributor Buena Vista has dominated the box office over a multi-year stretch due to successes across multiple brands such as Star Wars, Marvel, Pixar and Disney Animation releases. Buena Vista has held the most market share for the past two years and thus far leads 2018 by a wide margin. In 2016 and 2017 Disney’s studio captured 26.3% and 21.8% of the market share, respectively based on domestic box office gross. Disney’s studio is also the fastest to reach $1 billion in domestic box office gross and holds the three top fastest times. In 2016, 2017 and 2018 Buena Vista achieved this mark in 128, 146 and 117 days, respectively which are the three fastest on record. Thus far in 2018, Disney’s studio was the fastest ever to $1 billion in box office gross (117 days) and has captured over a third of the market at 35.8% market share. Black Panther became the third highest grossing movie of all-time domestically with $699.8 million and ultimately grossing $1.35 billion worldwide and becoming the ninth highest grossing movie of all-time. Avengers: Infinity War posted the biggest domestic and international box office weekend of all-time with $258 and $630, respectively. Avengers: Infinity War became the fastest movie to gross over $1 billion worldwide and only the fourth movie to ever break through the $2 billion thresholds ultimately grossing $673 million and $2.034 billion worldwide. The recent release of The Incredibles 2 shattered box office records bringing in $180.7 million during its opening weekend debut, not only shattering the previous opening weekend record for an animated film but finishing with one of the top ten openings of all-time for a film of any genre and already surpassing $650 worldwide. Furthermore, albeit Solo: A Star Wars Story didn’t bode well compared to Star Wars standards, the film has still grossed over $208 million domestically and $360 million internationally. Thus far, The Walt Disney Company (NYSE:DIS) has the top three grossing movies domestically with Black Panther and Avengers: Infinity War and Incredibles 2 by a wide margin from the fourth highest grossing movie. The remaining movie slate for 2018 consists of Ant-Man and Wasp, Christopher Robin (Whinny The Pooh), Wreck-It Ralph 2 and Marry Poppins Returns. 2019 has highly anticipated releases that stand to rack in billions in box office receipts such as Captain Marvel (the first female lead for a Marvel film), Dumbo, Avengers 4, Aladdin, Toy Story 4, Lion King, Frozen 2 and Star Wars Episode 9 (Figure 1). Disney is poised to defend its box office dominance through the remainder of 2018 and again in 2019. Before the release of Incredibles 2 McDonalds (MCD) partnered with Disney after a decade apart. The partnership will bring Disney content and merchandise back to Happy Meals. Disney severed ties with McDonald’s due to childhood obesity concerns and children's meals at fast food restaurants. "McDonald's commitment to balanced Happy Meals allows our two companies to collaborate on new ways to bring the magic of Disney to McDonald's consumers," Tiffany Rende, senior vice president of corporate alliances at Disney. McDonald’s plans to promote Wreck-It Ralph 2: Ralph Breaks the Internet in November. Since 2013, McDonald's has seen a 14 percentage point increase in Happy Meals ordered with water, milk or juice as their beverage, the company says. This partnership will flow more Disney content, merchandising and advertising towards a large consumer base domestically and abroad for its movie slate. Disney is slowing adopting Netflix’s streaming model via Hulu, ESPN and Disney’s direct to consumer streaming service that will hopefully remediate its stalled Media Networks business segment. Hulu has been gaining steam as of late with hits such as Handmaid’s Tale and The Looming Tower while acquiring rights to the sitcom 30 Rock. Recently Hulu reported that it now has 20 million subscribers and 800,000 live TV subscribers in the U.S. and added 3 million subscribers in Q1 of 2018 eclipsing Netflix's 2 million subscribers that were added in the same quarter. The total subscriber base of Netflix stands at 55 million. Thus Hulu still has a way to go to rival Netflix in sheer numbers. The jointly owned Hulu is adding advertising on its live television subscription and downloadable content in an effort to add revenue streams to the platform. Disney's coming branded app will have less content than Netflix because its content will be more appealing overall, Iger says. Disney might pursue early uptake of 2019's Disney-branded streaming service by pricing it "substantially" cheaper than Netflix. The company is making the right steps with its plans to target evolving media consumers with the two streaming services, JPMorgan's Alexia Quadrani says. The next two fiscal years look good for the film slate as well, she notes, with a pair of Star Wars canon films yet ahead, and another trilogy on the way along with stand-alone films like Solo. Disney’s streaming service will include content from Disney's four major brands (Disney, Pixar, Star Wars/Lucasfilm and Marvel). It will have 4-5 exclusive feature films per year as well as well as original series. Already in development is a Star Wars live-action series, as well as other series based on its Monsters film and High School Musical series. All-in-all, bringing all of Fox’s studio and TV assets into the streaming fold will only add to the formidable challenger that Disney is becoming to Netflix. The Walt Disney Company (NYSE:DIS) said it intends to remove all of its movies from Netflix and instead plans to launch its streaming service starting in the U.S. and then expanding internationally. Disney opted to exercise an option to migrate its content off the Netflix platform. Movies to be removed include Disney and Pixar titles, according to Iger. Netflix said that Disney movies would be available through the end of 2018 on its platform while Marvel TV shows will remain. 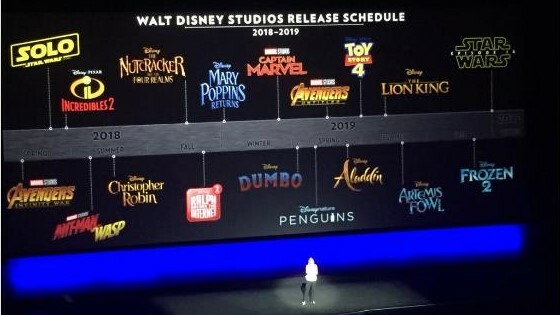 The new platform will be the home for all Disney movies going forward, starting with the 2019 theatrical slate which includes Toy Story 4, Frozen 2, and the upcoming live-action The Lion King. It will also be making a "significant investment" in exclusive movies and television series for the new platform. The Department of Justice approved the Disney’s renewed $71 billion acquisition for 21st Century Fox thwarting Comcast’s (CMCSA) attempts for the Fox assets. The government’s approval comes with conditions that Disney must divest all of Fox’s 22 regional sports networks. In December, Disney and Fox agreed to an all-stock deal worth $52.4 billion then Comcast countered with $65 billion. Disney was forced to increase its takeover bid to $71 billion in cash and stock, which Fox quickly accepted. Cable channels FX and National Geographic, Avatar and X-Men film franchises and international television networks: the European TV operator Sky and Star India. Those two networks are growing and moving into streaming which Disney is heavily focused. Disney will gain control of Hulu as well with a 60% stake. Disney and 21st Century Fox have a definitive proxy setting shareholder votes on their $71.3B asset deal for July 27. The of-record date for stockholders who can vote is May 29, 2018. This definitive date which would green light the acquisition puts Comcast in a problematic counter-offer position as the clock has stated on this vote, regulatory approval has been granted to Disney, and the superior bid from Disney was accepted by Fox’s board. The Walt Disney Company (NYSE:DIS) has growth catalysts in Parks and Resorts, streaming, studio strength and the Fox acquisition. Disney has been establishing a firm footing in the streaming space via Hulu (30% stake now converting into a majority 60% stake after the Fox acquisition), BAMTech, Sling, ESPN streaming service and a Disney branded service coming in 2019. Disney has been delivering at the box office with major hits such as Black Panther, Avengers: Infinity War and Incredibles 2. Disney is evolving to address the deteriorating Media Networks business segment with major streaming initiatives. Disney has one of its biggest movie slates for coming in 2019 after a record-breaking 2018 thus far with Ant-Man and The Wasp on deck. Disney looks to finally be acquiring 21st Century Fox with regulatory approval and Fox’s board accepting the superior bid for $71 billion to further drive growth. This acquisition brings in noteworthy studio assets such as more Marvel properties (X-Men and Fantastic 4) and Avatar along with TV content and international reach in growing markets. Disney offers a compelling long-term investment opportunity considering the growth, Fox acquisition, pipeline, Media Networks remediation plan, diversity of its portfolio, tax reform, share repurchase program and dividend growth.